I was on vacation at a beach in florida (20 minutes from home, but it's still a vacation), and had my camera and 300mm lens with me, taking bird photos and shots of my kids. In the afternoon, a small plane is flying low, parallel to the beach, when its engine sputters and it turns over the beach and starts to descend. It turns out it was making an emergency landing due to its engine failing. As it passes over me about 100ft up, I start shooting, running down the beach after, it, shooting, etc. I was fortunate enough to get the moment of impact. I shared it with my local newspaper, who in turn passed it on to the AP. It ended up running in a couple of magazines and a whole slew of newspapers worldwide. Given that this happened back in 2007, I'm hoping its been long enough ago that I can enter it in this challenge with some degree of anonymity. It isn't the "best" shot I have ever taken in terms of photographic quality, but it will almost certainly be my most memorable. This is an officer congratulating the pilot on a safe landing. I remember when this happened. heluva shot! Thanks for the story, glad to know everyone was OK. Came back to find out more - just goes to show "bring that camera with you." Nice one. Wow, some timing. It seems like the other spectators have hardly had time to react. Solid photojournalism! Hope that nobody was hurt... great capture. That pilot sure had a bad day at the office. Very brave of you to stay there while a plane is about to crash in front of you. If it is the moment of impact how come nobody is looking at the plane? Ooh, bummer! Great moment to capture, quick fingers, you! good street, er, beach reporting. Great action/editorial shot. Good timing. I hope no-one was hurt! Great timing. Too bad you had to witness this. Looks fatal. Can't wait to read about this! Right place at the right time for you, unfortunate for the plane. Amazing timing!!! I hope you sold this to a few newspapers. what a moment to capture, I hope everyone was ok! The reactions on the left I find the most compelling. If you could have gotten the plane to crash a little bit further over it would have improved the composition. Ok, I am being intentionally stupid. This is an excellent example of photojournalism and being in the right place with your camera. It should not be evaluated on artistic standards. This is one you would sell to the newspaper, not hang on your wall. I'll be checking back on this one. I want to know the details and if the folks in the plane were ok. The standing group look like they are already talking about it - or did thay just look up. Close call. Impressive. I do hope no one was hurt. The bikes are standing here if nothing is happened. Very nice. you get my holy crap 7. That is an incredible capture. Oh no! Wow what timing. Nice job. While this would make a good image for a newspaper story... it's not really a wonderful photograph... so I don't think it will score really well in this photography contest. Not sure if this staged or not, but it's quite the picture. I'm going to search for it after the challenge ends and hopefully read the details. I'm surprised how many people aren't paying attention to the crash. Oops! Interesting that a lot of people seem to be looking elsewhere. OK, after the challenge you have GOT to tell us the story behind this.. Strangely, the part that stands out to me more than the plane is the lady in the black dress - her expression says it all..
Glad you was OK, certainly was close. WOW talk about the right place at the right time! Impressive, most impressive. Hope everyone was okay. I like that the peoples' expression on the left is visible. for some reason I would think there would be a different reaction from the people there. Great capture! Ooops! Great job catching this shot. Once in a lifetime opportunity I am sure! You hardly ever see that! Crazy. Good timing with the camera in hand! Wow. Amazing that you were there to capture this. Wow! Not something you see every day! Interesting shot. Looks like everyone knows something just happened, but they don't know where. great photojournalistic image, i love people expressions, hopefully no one got hurt.... i would have cropped the bottom of the picture close to the blue line on the sand. I remember seeing this earlier in the year. How great that you had your camera. What a shot! That's pretty amazing timing. I hope no one was hurt! Oops! Great capture. Hope no one was hurt. 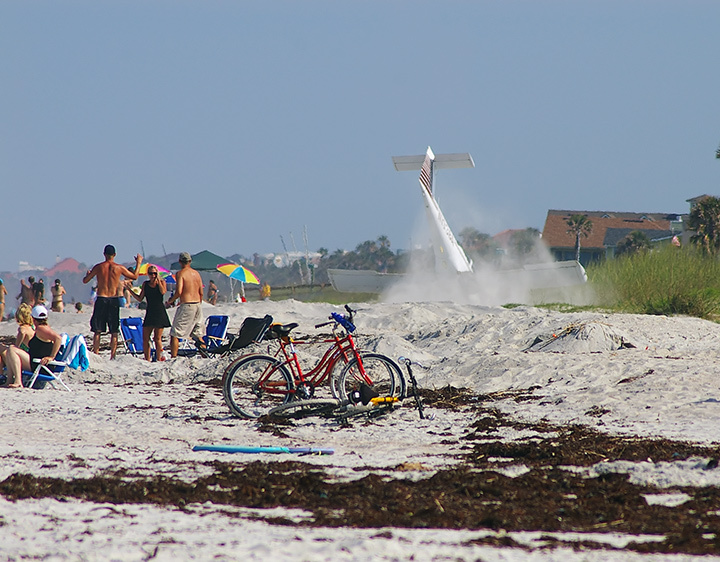 The "normalcy" of the bikes and beach scene are a great contradiction to the shock of a plane crash. Well captured. Hope all were okay. awesome timing!! You got it! The people dont seem to worried? I hope the people inside are ok? Nice capture tho! Oh my you were on top of this! What a capture. wow, talk about being in the right place at the right time! Thank goodness no one was hurt!! WOW, right time right place, hope no one was hurt..
Nice catch. The foreground is a bit distracting to me, but I love the people at the moment of impact. I can see why you'd want to submit this shot. It has great impact (no pun intended), although from a technical aspect there is room for improvement. Proudly hosted by Sargasso Networks. Current Server Time: 04/18/2019 10:54:06 PM EDT.